So within 3 days we've built 2 huge new volumes on 2 parts of the circuits walls and created a new part to the old slab on the comp wall. 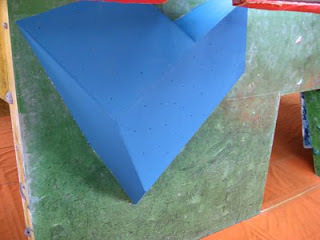 These have all now been painted and are currently drying meaning the next stage is just about here, setting. 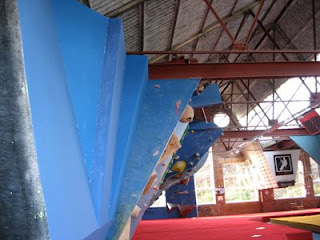 2 views of the new 'volume' on the wall opposite the kids boulder. 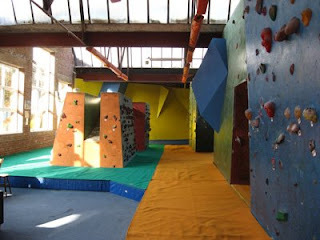 Thursday will see both the competition wall stripped and some new problems go up on the new walls / volumes so by this weekend you should have 25 new comp problems and about 10-15 new problems on the circuits walls. Not bad for a week's work. 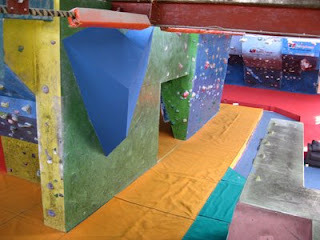 The new wall on the old slab part of the comp wall. Now no longer a slab, well 1/2 of it anyway.